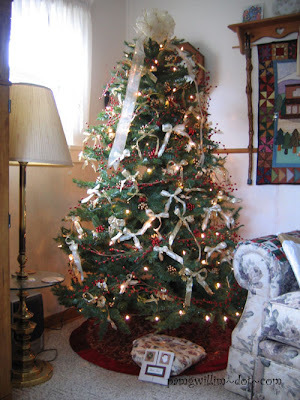 I visited Pam's blog today just to discover a really picturesque photo of this Chiristmas tree. Underneath it is my Secret Santa Chrsitmas Gift for Pam!! 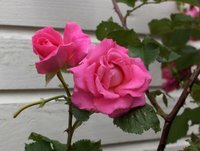 I hope you forgive me for borrowing your picture, Pam, but it was too wonderful not to!! This is my Advent Table runner. I've had it for years and I always take it out in time for 1st Sunday of advent, where it lays under a four candle chandelier. Advent is the time in which we prepare to celebrate the birth of Christ. Waiting is not something I'm good at - So in the spirit of the Chstmas carol "12 days of Christmas", I celebrate a little each day. I listen to A LOT of Christmas carols/music. I do my best to make the Christmas shopping enjoyable and stress free.... The baking is something I do because it's something we can do togheter as a family - not beacause it's required to make seven different types of Christmas cookies and I don't clinically clean the whole house either!! 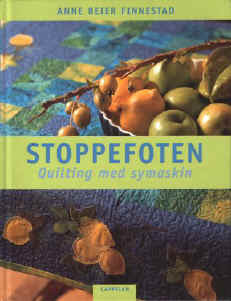 The Advent table runner is from this book "Stoppefoten" by Anne Beier Finnestad. 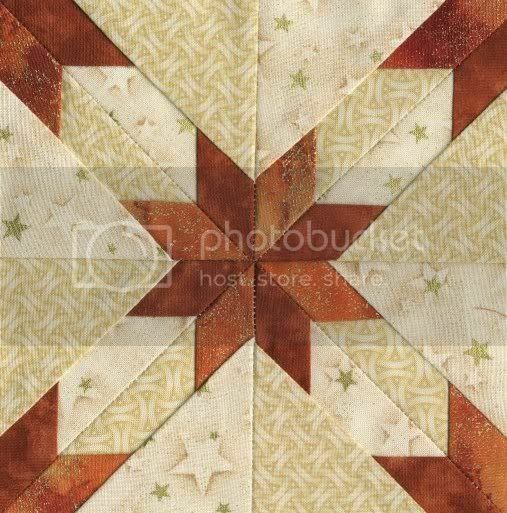 It contains many fun projects of interior design character with applique, freehand embroidery and machine quilting. How great you know the giftie has reached Pam! I love that advent table runner! The detaiis are so cute - I'm sure it looks great with the candles! That bag is great, I love it! I wish I could get one of those tildas books here in Canada! Lovely! So koselig for deg å de julegaven din under juletreet til mottakeren. Og så nydelig ting du også har sydd. Jeg synes også førjulstiden er koselig, selve prosessen fram mot jul, uten å stresse for mye med at alt må være rundvasket, pakket og klart. Men nå er julen stort sett i "boks" her hos meg, så resten av tiden blir det bare å kose og å nyte det hele. Stikker innom for å ønske deg GOD JUL og GODT NYTTÅR! Kos deg masse! Vil bare ønske deg og dine en riktig god jul og et flott og krestivt nyttår! !